Bean Bags R Us NewsOutdoor Bean BagsAt Last Australia Gets its First Beach Bar! Beach bars are all the rage in the United States, Asia and Europe. They offer great settings in which to soak up the sun’s rays while enjoying music, food, cold drinks and posh seating. Until now, though, beach bars haven’t graced Australia’s thousands of kilometres of coastline — but that’s about to change. In January 2018, Moseley Bar and Kitchen received the appropriate permits to construct a beach bar on South Australia’s Glenelg Beach. The 750-square-metre Moseley Beach Club will offer luxurious beachfront seating for up to 350 people north of Glenelg Pier. Live music will be a fixture at the Moseley Beach Club. Guests will enjoy low-key acoustic performances on weekdays. During weekends, DJs will perform dance music that’s certain to please the party animals. In arranging the club’s performance schedule, the creators of the Moseley Beach Club have worked hard to strike a balance and create a venue that’s family friendly while still catering to the youthful crowd likely to visit the beach on weekends. The restaurant staff at Moseley Bar and Kitchen will provide food and beverages to guests at the Moseley Beach Club. Some of the food and libations on offer include Hawaiian poke, sandwiches and beverages served in coconuts and pineapples. The snacks and drinks are certain to please anyone looking for refreshments while they enjoy the club’s comfortable seating. The Moseley Beach Club will offer three seating tiers to meet the needs and budgets of all guests. During the morning and afternoon, the club will offer free entry. Ample outdoor beanbag chairs will be available for seating. After 5:00 PM, the club will charge guests a $5.00 entrance fee. Beanbag chair seating will remain free after 5:00. The club will also offer lounge chairs and double daybeds. The lounge chairs will seat one person each. To reserve one, you’ll need to spend at least $50 on refreshments. The double daybeds seat up to four people. To get a daybed, you — or your group — will need to spend at least $100. The club will provide towels to guests for free. Alternatively, you can buy your own towel from the club for $20. Why Are Beach Bars So Popular? 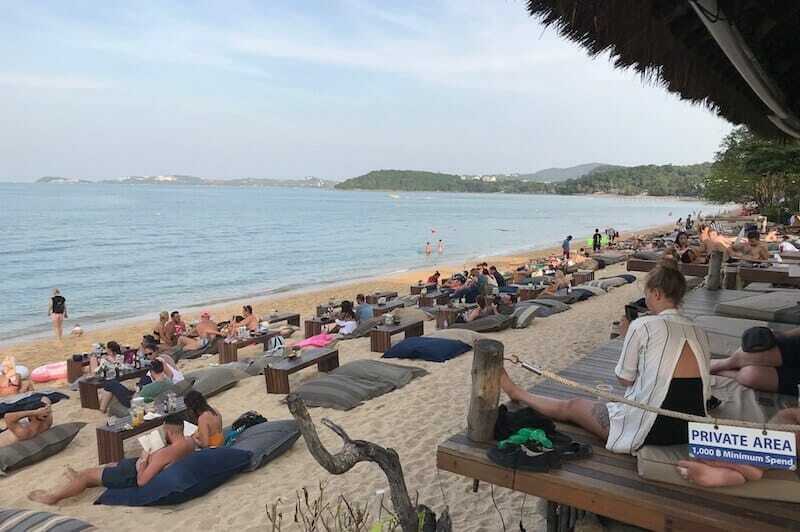 Some Australians have expressed concerns about whether the Moseley Beach Club is the beginning of a new trend toward the commandeering of public land by private enterprises. One of Australia’s greatest natural resources is its seemingly endless coastline, though, and beach bars have gone over extremely well with the public in other regions throughout the world. Some people prefer to bring their own lunches and lounge on their own towels when they visit the beach. Others are willing to pay a little extra for upgraded seating and a bit of pampering. Going to a beach bar means that you don’t have to pack and unpack your own beach chairs and umbrellas. It also means that you can enjoy your food and beverages at the peak of freshness — not after they’ve been out in the sun for several hours. We believe that Australia’s coastline offers ample room for both types of experiences, and we welcome the fact that the beach bar trend has finally begun to reach our shores. Why Are Outdoor Beanbag Chairs Ideal for Beach Bars? If you haven’t visited any of the world-famous beach bars in Thailand, Bali, Florida and the Mediterranean, you might wonder why the proprietors of those establishments so often use outdoor beanbag chairs for their seating arrangements. Beanbag chairs are popular at beach bars both because they’re incredibly comfortable and because they’re resilient in difficult weather conditions. A beanbag chair can accommodate a person of almost any weight or size — and nothing feels better than sinking into an outdoor beanbag chair after a brisk swim or game of volleyball. Is your swimsuit wet? Have you spilled your drink? No problem; beanbag chairs resist water, stains and mould. Spot cleaning is usually all that’s necessary to remove a stain. Beanbag chairs are also a delightfully low-maintenance seating option for beach bars. Since they’re incredibly light, they’re easy to move. At the end of the day, beanbag chair maintenance is as simple as shaking off the sand and moving the chairs to a storage area. Since beanbag chairs are inexpensive, replacing them periodically won’t break the bank. Traditional beach lounge chairs, in comparison, are very costly to replace. We welcome the emerging beach bar trend in Australia and are proud to be Australia’s leading outdoor beanbag chair manufacturer. Our beanbag chairs are comfortable, durable and weather resistant while being affordable to purchase and easy to maintain. Our proprietary heat transfer process allows us to add any logo to a beanbag chair for powerful branding. If you are in the process of opening a beach bar or other outdoor venue, contact us now to discuss what we can do for your seating arrangements. Which Bean Bags did Channel Seven use at the Greek Festival?